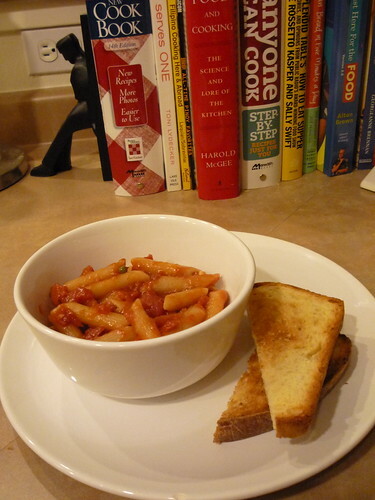 This is something I like to make when I go home late and a little bit tired, since it's an easy one-pot meal. And it is made from stuff in your pantry, so you can still make it even if you're running out of fresh ingredients. 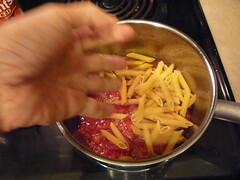 Put in a couple of handfuls of pasta. Or just one handful if you have big hands. 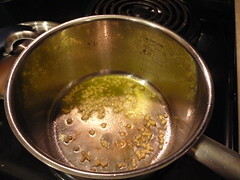 Stir the ingredients, season, and cover the pot. Lower the heat. 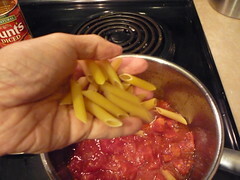 Cook until the pasta absorbs most of the excess liquid. 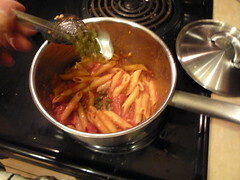 If you think it's a little too al-dente, add a few tablespoons of water. 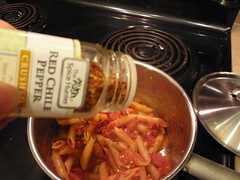 Then, when it's cooked, add some capers and chili flakes. And we're done! Easy peasy. You might want to put some anchovies in there, with the tomato sauce. I like to eat it with some toast. If the bowl below is the size of your serving, there is enough for two. Personally, I just eat it all myself. 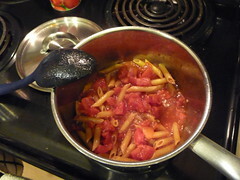 hmm...nice, i never thought of cooking pasta with the tomatoes. normally we'd still cook the sauce and the pasta separately. 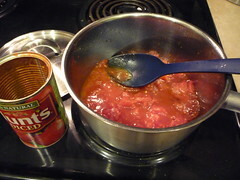 Heh, I usually make pasta sauce separately from the pasta too, but sometimes just get too tired/lazy to cook stuff the normal way.